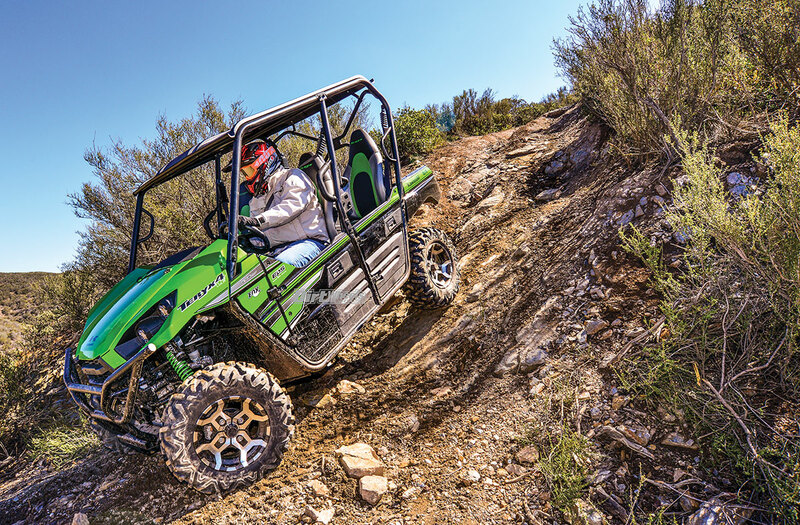 The Kawasaki Teryx4’s ground clearance of 11.2 inches helps it clear rocks, roots and other trail debris. Kawasaki is one of those dependable brands that we are able to trust to build impressive machines. 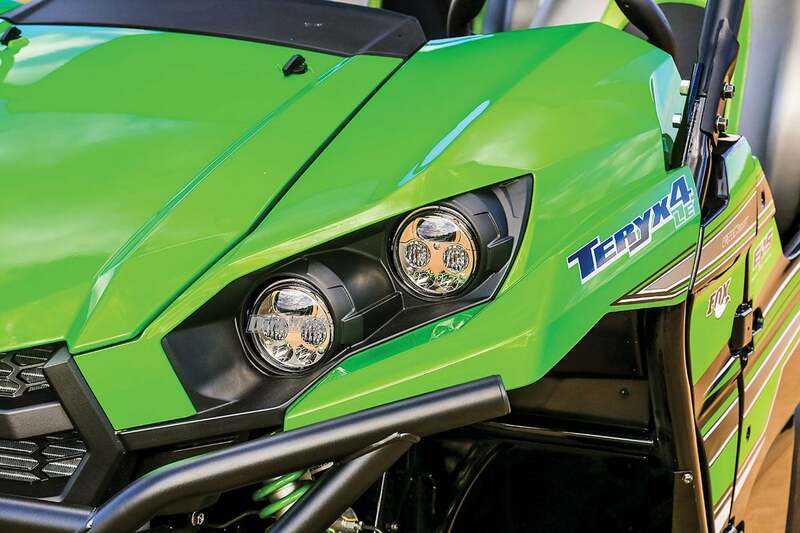 The Teryx lineup has sold very well, and for good reason. 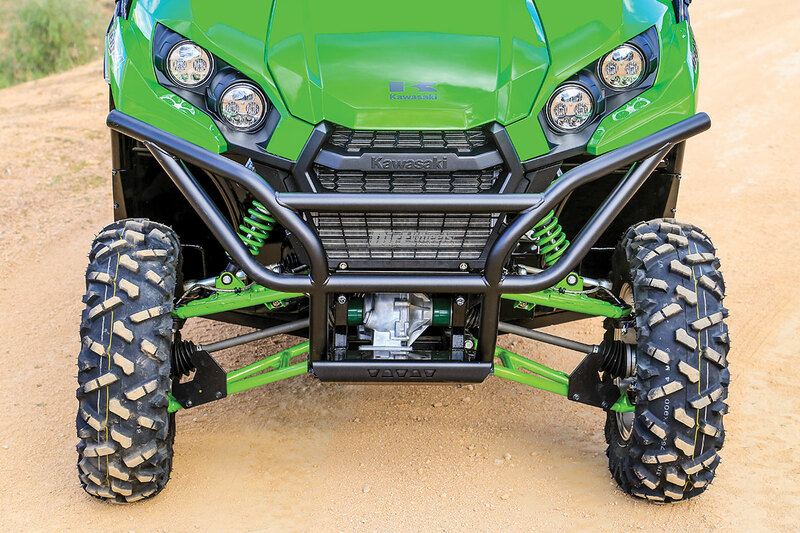 It’s a well-built UTV that looks absolutely stunning in the Teryx4 Limited Edition brilliant Lime Green color scheme. The fit and finish are amazing, with automotive-style paint that rivals anything at a car dealer. It made us cry to take it on brushy trails, but we did! The Teryx4 is well-focused on recreational utility use. It carries up to four in sublime comfort in a nicely appointed cabin, and the time Kawasaki and Fox have spent on the suspension really shows on the trail. 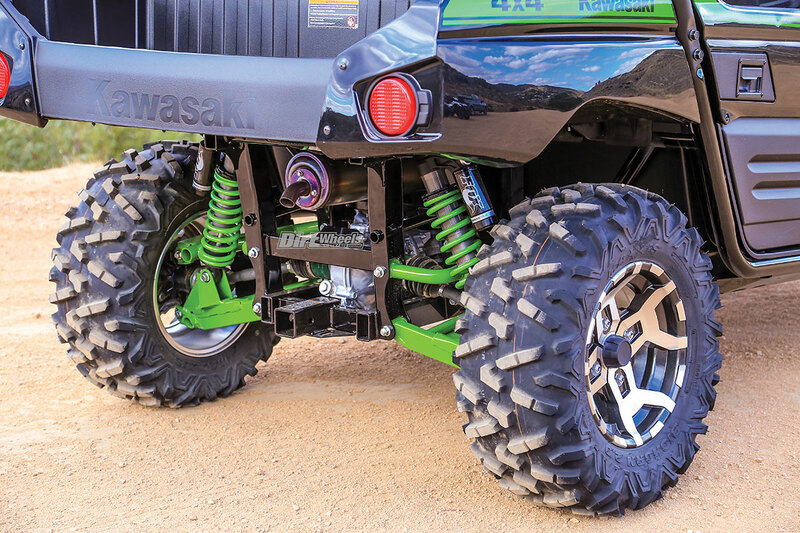 Kawasaki’s LE model comes with 14-inch aluminum wheels with 27-inch-tall Maxxis Big Horn 2.0. 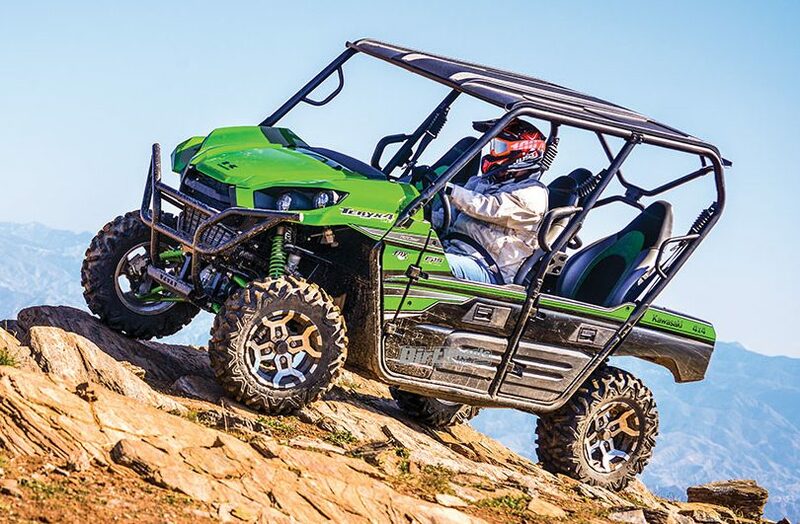 Kawasaki’s Teryx has a refined yet potent 783cc, V-twin four-stroke motor with great low-end power that is smooth and easy to control. Kawasaki designed the machine to be more of a mid-engine than a rear-mounted engine like most other manufacturers. The upside is more even weight distribution between the front and rear wheels. The downside is in-cab engine noise and is more difficult to work on. When you are low-rpm cruising, engine sounds are subtle, but once you put your foot in it, the decibels climb. LED headlights have high- and low-beam options. There is also a rear LED brake/running light. The engine is paired to a CVT with forward high and low gears, a neutral position, and a reverse gear. There is no park; you must set the handbrake. The dash is simple and easy to reach. There is a roomy glove box in front of the passenger seat. The Kawasaki has a great four-wheel-drive system that includes a front-locking differential. A switch on the dash lets you swap swiftly between two- and four-wheel drive or jump to 4×4 with diff-lock. The steering is generally light with the EPS system, but the steering gets a little heavier in diff-lock. The Kawasaki body was designed well enough to keep most mud and rocks off of you while driving. You will be surprised how good the Teryx4 LE’s suspension is for the amount of travel it has. The front dual-A-arm design with Fox Podium shocks has 8 inches of travel out of each side. The dual-A-arm IRS has 8.3 inches of travel. There are only fractions of an inch difference between the Teryx4, new Yamaha Wolverine X4 and the Honda Pioneer 700-4. But, the Kawasaki Teryx4 LE is the only one in its class with 24-position-adjustable compression and fully adjustable spring-preload piggyback reservoir Fox Podium shocks. These shocks easily outperform basic non-reservoir shocks and won’t fade as quickly when they get hot. IRS dual-A-arm suspension travel is 8.3 inches. There is a 2-inch receiver built in. The Teryx can tow 1300 pounds. 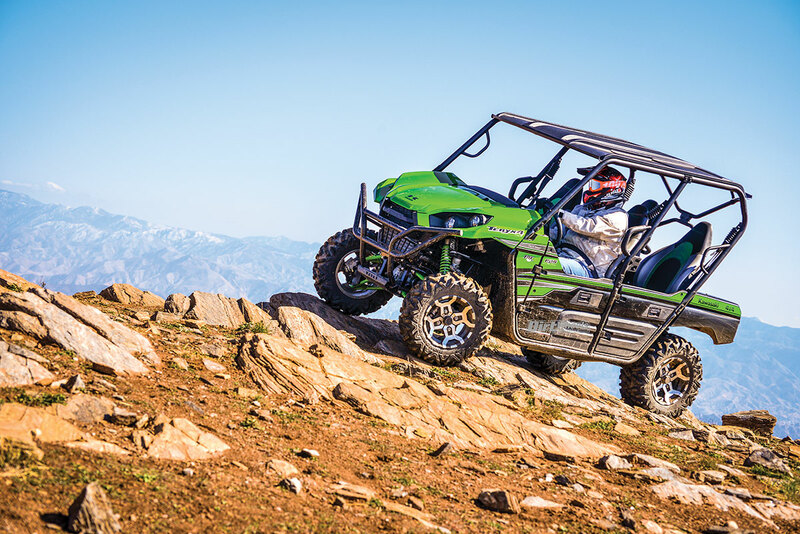 The Teryx4 comes stock with electronic power steering and a wrapped steering wheel. 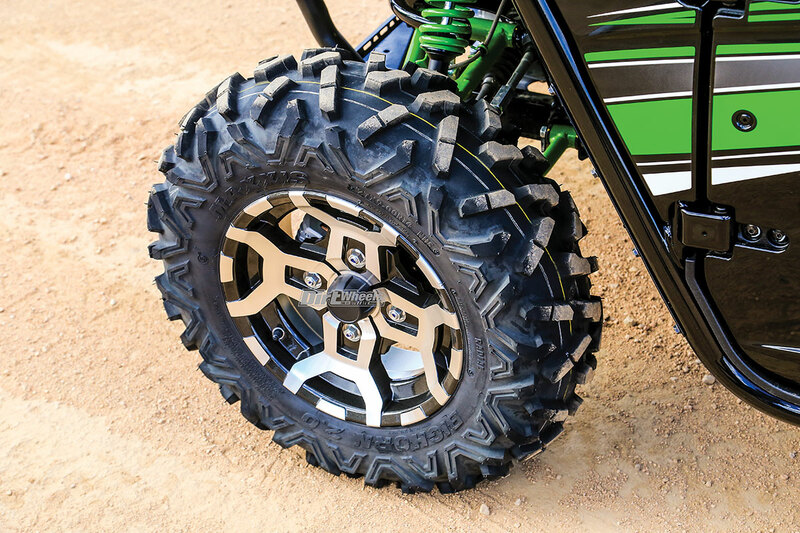 The LE comes with 14-inch aluminum wheels and 27-inch-tall Maxxis Bighorn 2.0 tires. The IFS utilizes dual A-arms with Fox Podium shocks with 24-position compression adjustment. A front sway bar helps stability. The 60-inch track width allows you to fit on a majority of designated trails. The downside is that 60-inch machines feel less confident in turns and on cambers than 64–72-inch-wide sport machines. The Teryx4 is quite well behaved on most terrain, unless you decide to put it through trails that it has no business traversing. It can feel narrow straddling big ruts and on steep cambers, but most of the time it feels very composed. 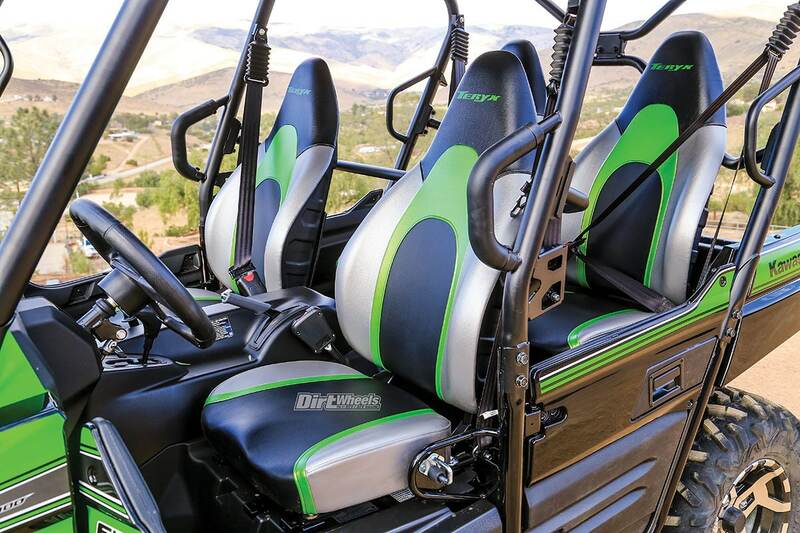 The Teryx4 comfortably seats four. You lose storage and bed space compared to the two-seater version. The Teryx fits four people in comfortable seats inside a roomy cockpit. There are two storage bins behind the seats and an abbreviated cargo bed in the back. Kawasaki didn’t want to lengthen the wheelbase to add the back seats. That would have sent the company back to the drawing board and cost a lot of money to make a new frame. 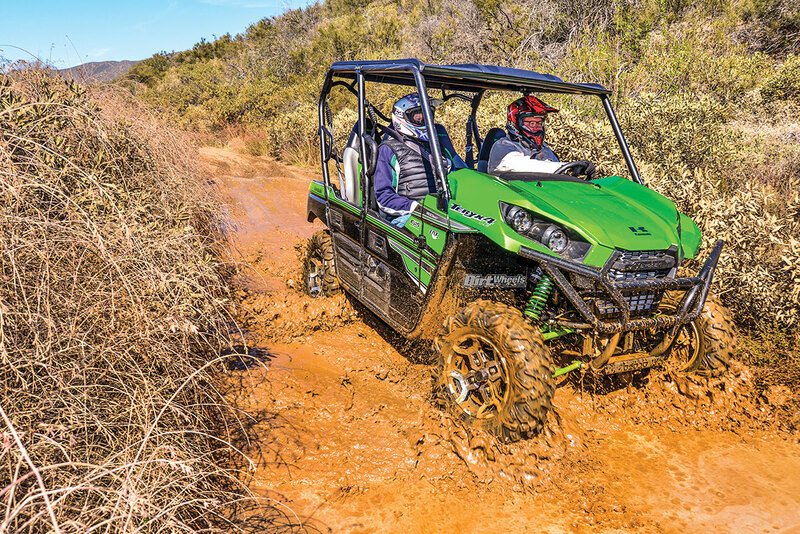 A lot of Kawasaki’s customers like to ride in the woods or on very tight trails, and a longer UTV won’t handle that well. Kawasaki decided to shorten the cargo bed of the machine to fit the second row of seats and keep a wheelbase of 85.6 inches. This keeps the turning radius a compact 16.7 feet. The cargo bed is large enough to fit a cooler and other items you want to carry on a riding or hunting trip. There are metal tie-down hooks to hold your cargo steady. Some of us require a UTV that can tow. The Teryx4 ably pulls up to 1300 pounds and conveniently comes stock with a 2-inch rear hitch receiver. The cargo bed can handle up to 249 pounds, and there is a glove box and cup holders. Another plus is that no tools are required for the easy-access air filter. The cockpit of the Teryx is pretty simple and ergonomic, but you can add a sound system and other items to it through the accessory department. The steering wheel is height-adjustable, and the driver seat is also adjustable. The seating position feels upright but not uncomfortable. 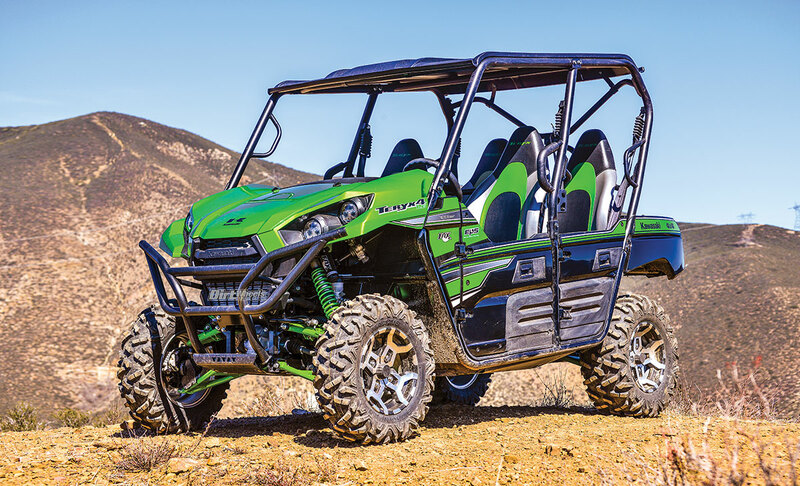 Lime green is one of three great colors that the LE Teryx4 model comes in. You also get a front bumper. We were quite happy with the Teryx’s power output. It is easy to manage, and you have what you need when you need it. The bottom-end torque is potent, and then it keeps a consistent pull until you reach the end of the high range. 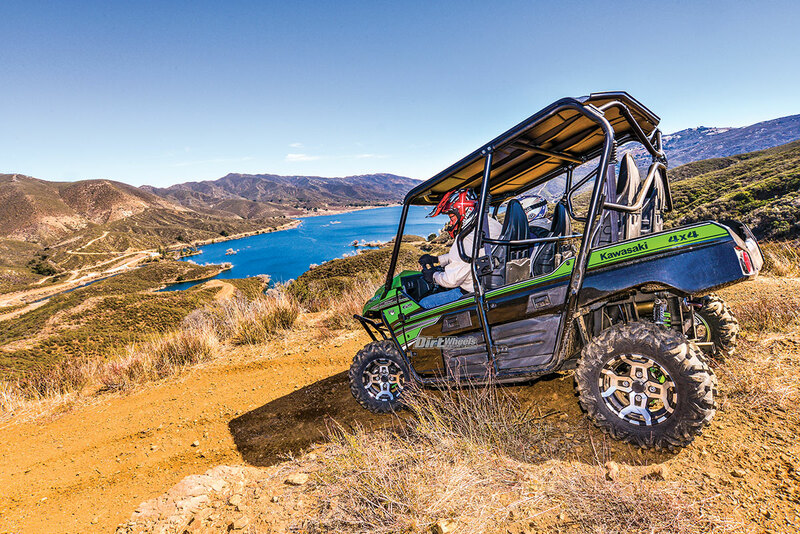 Low gear lets you chug along up steep climbs and over large rocks, but the somewhat short 11.2 inches of ground clearance can hinder the machine on occasion. The engine braking system does well. It isn’t overpowering yet allows you to keep constant control of the machine on descents. Thanks to the Fox Podium 2.0 shocks, the suspension is supple and smooth over slower-speed chop. It soaks it up wonderfully and only starts getting rough at higher speeds. Even at a faster pace, the shocks do a good job taking the abuse. You won’t be skipping big rolling whoops or hucking the Teryx4 high into the air, but it does quite well for what it’s meant for. When you load the green machine down with passengers and cargo, it still does its duty. We did up the rear shock’s compression damping a few clicks to reduce the chance of bottoming out. Low gear in the CV-style transmission and the engine braking system holds the Teryx4 back well when descending. The steering is light and smooth. We only noticed it change when driving faster. The UTV felt like it wanted to wander a bit, or when you engage the 4×4 diff-lock function, it tightens up. Diff-lock should be reserved for low-speed sections. Don’t expect to slide corners with tons of extra power and composure with a 60-inch-wide machine. The Teryx4 does a great job of not being too tippy and working its way through corners well, though. We have been, and still remain, fans of the Kawasaki Teryx and Teryx4. It is a great platform that is reliable and tough. The ride is smooth, and you can take your family and friends with you for the fun. You can purchase the Teryx4 in a Bright White base model for $15,799, upgrade to their $16,299 Camo model or go for the LE version starting at $16,999. The LE model comes in Matrix Camo Gray, Lime Green or Candy Plasma Blue. Kawasaki also makes some great ATVs, so check out their full ATV and UTV lineup at www.kawasaki.com. The turning radius of the Kawasaki is 16.7 feet. It handles corners well for its 60-inch track width. Cargo bed capacity 249 lb. 2019 ATV BUYERS GUIDE: UNDER 12K!